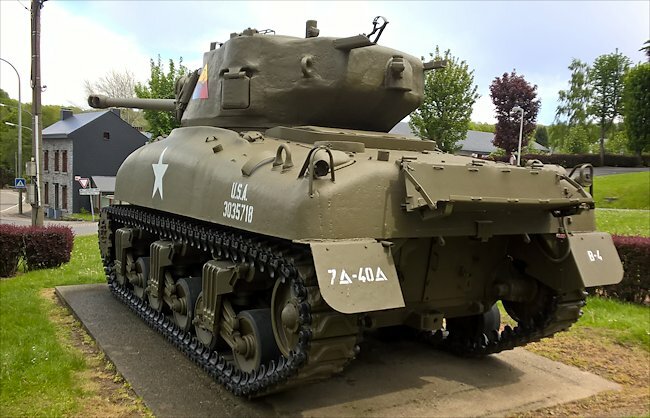 This Surviving M4A1(76)W Sherman Tank took part in the 1944 WW2 Battle of the Bulge in the Belgium Ardennes. It has been restored and can be seen on Rue Hermanmont, the N675, in Vielsalm at the Junction with Rue Jules Bary. 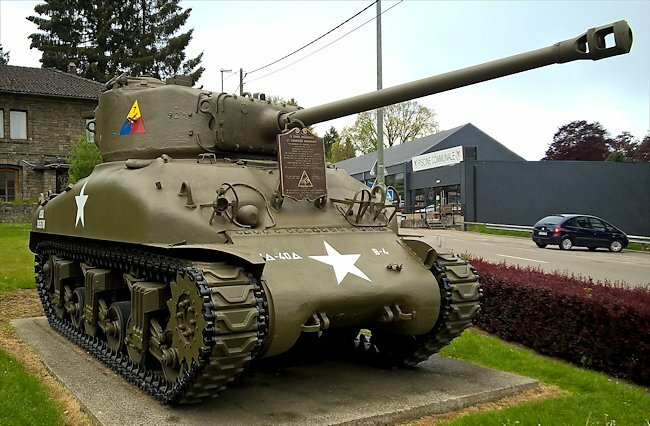 General Bruce Clarke first offered a Sherman tank to the town of Vielsalm in 1976. It was transported to its present location from the Grafenwohr Depo in Germany and arrived on 20th February 1984. It was dedicated to the memory of every American unit, which fought in the Saint-Vith salient during the battle of the Bulge. Notice this Sherman has the bigger 76 mm gun with a one piece cast nose. It also has the more difficult to make cast hull, and the bigger T 23 type type. It does not have the additional protective armour plating for the driver and hull machine gunner. 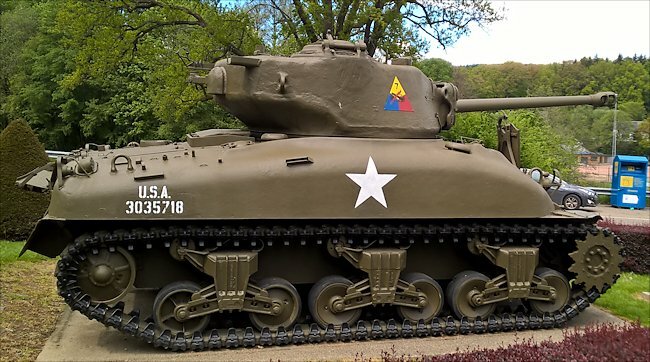 Rear view of the M4A1(76)W Sherman Tank. Notice its larger turret to take the 76mm gun. What is Sherman Tank Panther Gun Mantel Ricochet shot? On 19th December 1944, during the Battle of the Bulge in the Belgium Ardennes, at about 3.30pm just behind the last of the retreating M4 Sherman tanks, a German Panther tank suddenly appeared out of the fog. It was almost on top of the American force the Panther’s over confident young crew were slow to react. One of the rear-guard Shermans managed to fire first. At that range the Panther did not stand a chance. The American tank crew knew where to aim for when confronted by a German Panther front on. There was only one place that would knock out a Panther. They fired at the lower section of the curved protective gun mantle. The German panzer crew stood no chance. The armour piercing shell bounced off the gun mantle and straight down onto the thin driver’s hatch deck armour plating, killing the driver instantly. The shell zipped around the inside of the tank and must have detonated the racked ammunition as seconds later the Panther tank brewed up. The M4A1(76)W Sherman 76mm gun had a muzzle brake fitted to reduce recoil. The advancing Panther behind that also burst into flames as another carefully aimed gun mantle Ricochet shot at close range knocked it out. A third panther came out of the fog and filled the sights of a M10 Wolverine Tank Destroyer. Its gunner aimed their shell just in front of the advancing Panzer V tank. It hit the road surface and bounced upwards penetrating the hull floor. A second shot hit the muzzle break and the end of the Panther’s 75mm gun shattered as it burst into flames.